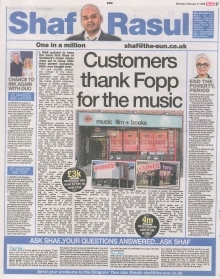 Customers thank Fopp for the music. I was pained to hear the news that three of Scotland’s biggest music stores are set to close after their parent company, HMV, was bought over. It’s just another seismic sea change in the entertainment consumption landscape over the years, and the latest chapter in the music giant’s turbulent history of recent years. Among the sites to shut – along with HMVs in Ayr and the Braehead Shopping Centre – will be the Byres Road branch of Fopp in Glasgow’s west end, a much-loved haunt of record hunters. It’ll undoubtedly be a sad loss, and another sign of the times as everyone migrates their buying habits online. Fopp was founded in 1981 by Gordon Montgomery and it started out as a stall in De Courcy’s Arcade, just a short walk from the Byre’s Road branch. Montgomery actually set up Virgin’s first Megastore before he was made redundant, and with £3,000 severance pay he set up the stall and the rest is history. How’s that for some entrepreneurial spirit? The record store landscape was of course very different in the eighties and nineties. There were the power houses Virgin, Our Price, and Tower, along with a string of rival independent shops. Fopp broke into that market by providing heavily discounted vinyl before entering and expanding into the books and videos market, before eventually selling CDs and DVDs. Unfortunately disaster struck in 2007 when the company went into administration, which ended Montgomery’s involvement in the firm. HMV bought the Fopp brand later that year and managed to reopen six of the stores. Without a doubt, the decline of shops like Fopp in the UK is due to shifting customer demand. Streaming is now so readily available online – for both music and video content – and with unlimited subscription services from £9.99 a month, it’s not hard to see why so many people opt for this service. I grew up in a time when music was a lifestyle symbolised by having a vinyl record under your arm, and pocket money was spent travelling to the city centre and browsing in record shops for hours on end. The culture was hugely different back then - it was more of a social occasion to spend an afternoon choosing the music you loved, admiring the artwork on the sleeve, then comparing purchases on the way home before immersing yourself in the music. However, there is clearly a trend towards vinyl records making a comeback that continues to grow arms and legs. In fact, recent years have shown an all-time high in sales. More than four million vinyl records were sold in the UK in 2017 and it is reported that 59 per cent of the UK population now owns at least a few records. Sometimes the old ways are the best, and listeners are cherishing the warmer vinyl sound and tactile record sleeves that the digital era has never been able to replicate. We seem to be going in reverse, but in the best possible way. It’s as if music listeners are now collectively thumbing their nose at the music industry’s too often poor decision-making down the years that saw profits placed ahead of quality experiences. Who knows what could be next in this backwards-looking trend? Perhaps in a few years we could see shops specialising in ‘antique’ music devices by stocking cassette players, CD and Mini Disc players and even iPods! However you choose to listen to music, I’d encourage you all to shop independent, or at least spend with dedicated music retailers. If we don’t make use of and support our local music shops, there’s an inevitability of the bigger names diving in and attempting to take them over, eroding the characterful values that made them great in the first place. Smart spending decisions will help to ensure the UK’s wonderful music scene remains on song. Period Poverty has been dominating the news recently and rightly so – it’s on the rise in the UK. The topic hit the public consciousness in December 2016 following the release of Ken Loach’s hard-hitting film I, Daniel Blake, and it’s remained high on the news agenda ever since. So it was great to see Buchanan Galleries in Glasgow announce that it has become the first shopping centre in the country to provide access to free sanitary products for those experiencing period poverty. The move follows a high-profile campaign to increase access to free sanitary products with the Scottish Government to provide products to all those in education as well as to low income women and across public buildings and services. Last month, the Scottish Government committed another £4 million to combat the issue following the rollout of free products at schools, colleges and universities. Communities Secretary Aileen Campbell also backed the campaign and was encouraging other organisations to take this small step to provide free sanitary products wherever possible. Social enterprise Hey Girls also recently launched its Social Impact Report 2018, which reveals the organisation donated in excess of 2.3 million pads and tampons to people across the UK in under a year, and includes supplying menstrual products to over 1,400 schools in 12 local authorities across Scotland and products to nine universities and colleges across the UK. Celia Hodson, founder of Hey Girls, gathered partners, supporters, investors, government officials and customers to offer a collective thank you for their support in Edinburgh. I am proud that Scotland is taking action on this. Glasgow’s answer to Channels 4’s Tattoo Fixers has arrived and it’s giving one lucky (or unlucky) Glaswegian the chance to have their inky regrets removed. Husband and wife duo David and Mae Reilly have just opened Erasure Skin in Maryhill after years of running a laser clinic in Florida. Having seen some of the biggest body art blunders, they have put a call out for the worst tattoos to come forward. So if you have a drunken inking from your teenager years or an ex’s name you would prefer to forget, then get in touch with them. The clinic will pick their worst tattoo and offer that person the chance to have their tattoo completely removed without paying a penny. Time to wave goodbye to your unwanted ink. I agreed with Glasgow Labour leader Frank McAveety last week as he described the decision not to pursue plans for a direct rail link between Glasgow city centre and Glasgow Airport as a ‘betrayal of the city’. Glasgow remains one of the few cities of its size that does not have a dedicated rail link to its main airport. Despite the project being recognised as having wide benefits for the west of Scotland, the plans have been discarded to make way for an alternative shuttle pod system between the airport and Paisley Gilmour Street station.